The future may be spoiled. 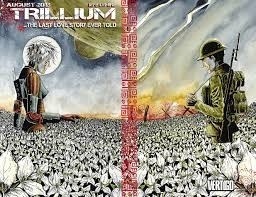 Written and drawn by Jeff Lemire, Trillium is the story of a scientist and an explorer who cross time and space. To know the reason why, we will have to wait for issue two. The book is set in the far future world of 3797 where a sentient virus has brought human kind to the edge of extinction and forced the survivors to escape to the stars. On an alien world a flower called Trillium has been discovered that may hold the key to a vaccine for the virus. It is scientist Nika’s job to study the culture of the natives and learn to communicate with them so that the humans can use the trillium. When a scientific expedition is mysteriously killed the time table is moved up for Nika to complete her work before the humans take the Trillium by force. This causes her to take matters into her own hands, breaking scientific protocol, and establish contact with the native tribe without a proper language translation. What happens next is a tense and masterfully written and drawn series of events which culminates in the readers being thrust back in time to 1921 where we meet our second main character William. William is on a journey through the jungle in search of an ancient lost city and his over zealous attitude causes him to go down a dangerous route and run afoul of a murderous tribe. The story of this issue does not give us much in the way of motivation for why William seems so desperate to find this lost city, however through brilliant visual story telling we are given a deep insight into Williams overall character as he suffers from post traumatic flashbacks from his time in the war. This issue is a brilliant set up to what I hope will be an equally brilliant series. It sets the stage for an epic adventure and ends on a cliff hanger that leaves one desperate to know what happens next. Was the time travel caused by the mysterious flower Trillium? Will two people from totally different worlds be able to overcome the obstacles of an increasingly hostile environment? We will have to wait for issue two to find out. movie serials with art that recalls old pulp adventures and I can not recommend it highly enough. This entry was posted in comic books, reviews and tagged adventure, comic books, love, science fiction, Vertigo. Bookmark the permalink.